With its remarkable exhibition journey, DISTANT REFLECTION presents us with a set of recent works made from photographic prints and videos. These are marked by a web of variable reactions, as if they had been drawn, designed, and constructed beforehand as a model, with the thinnest layer of snow from the alpine mountain ridges, melted by the simultaneously anachronistic and timeless social engine of memory. As one walks into DISTANT REFLECTION, the first thing one notices is a collection of another collection of landscape postcards (around 300, in their original format). The postcards nudge us, as Marina Camargo’s works often do, to remind us to keep renewing the spirit of our times with a sharp sense of nature – inspired by images, in the here-and-now. In the exhibition, alluded meanings leap from the walls in associative connections within our gaze: iconic sceneries of German Romanticism, as inscribed in art history by painter Caspar David Friedrich (1774-1840) are juxtaposed with photographs from old books, found in forgotten second-hand bookstores. These pictures portray the Zugspitze (the highest peak in the German alps), overlapped with layers of postcards from the Dolomites (the Italian alps) – images that had once been seen in a flea market, only to disappear in an unnamed town. Or even, as a sort of contradictory complement, which might evoke certain scenes of Aleksandr Sokurov’s Moloch (1999), the fictional film that recreates the love affair between Eva Braun and Adolf Hitler, in intimate encounters set in the iconic Kehlsteinhaus (a cottage on the border of the German and Austrian alps, best known as the Eagle’s Nest, which was Hitler’s official retreat location during World War II). 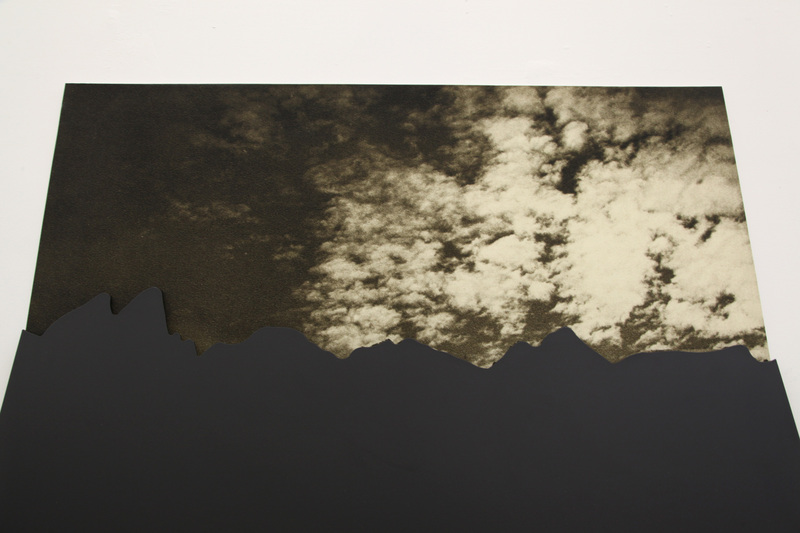 The works of Marina Camargo, in special Alpenprojekt (2011) and Alpenprojekt II (2013), respond to a specific context visual thought and output, based on the relationship between the places where we live, the books we read, and the landscapes that we have seen. Facing the colossus of each chosen mountain, the artist allowed for time and space in her contemplative work process, holding meditation as an attitude, as she initially attempted to draw, cut-out, and ultimately preserve, for herself and the world, the concept of mutability in the lines of the horizon – lines that do not actually exist, either in space or time. Marina Camargo previous series include city maps with letters and light spots combined to bring together rare text and stellar letters (Some air in between, 2011 and Map II (Porto Alegre), 2009), as well as instruction manuals with technical drawings (Lessons in Sculpture – Brancusi in Air, 2002 and Distracted feelings, 2006). Behind her artistic processes is an overt desire to intervene in reality (landscape architecture), to show her own point of view in her chosen field of research and interest, namely urban-natural landscape studies. 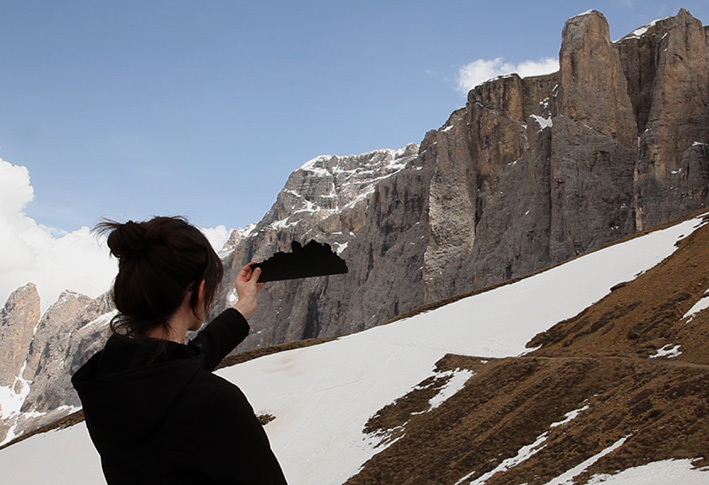 DISTANT REFLECTION invites visitors to accept an invitation to pay attention to the meaning of the verb-word ‘Bergwandern’, which freely translates from the German as “to walk on foot through the mountains”. Over the course of a stroll, we find a few immemorial images revealed, even though there is still much to uncover before we can fully see them. Text written for Marina Camargo’s exhibition DISTANT REFLECTION, at Bolsa de Arte gallery (Porto Alegre, Brazil). October, 2013.